The perfect Christmas gift for style lovers that treasure their independency is a Rollz rollator. It enables people with limited mobility to visit that nice Christmas fair, to walk without help or to join the family trips and days out. Moreover, it helps to stay fit, to keep up with the grandchildren and to bring home the shoppings. Are you looking for a great looking rollator? One your parents or partners will definitely use and walk proud amidst relatives? Choosing a smart, modern, smooth rollator definitely helps to convince people to actually use their device. Some people hesitate about using a rollator and postpone this for too long because they assume that using a traditional walker implies clumsily colliding into door-jams, walls and furniture. Nobody wants to feel awkward, impaired and limited. In short: people don’t want to be seen with an ugly walking device. Our rollators are quite the opposite, a beautiful piece of design. The Rollz Motion is a real design statement, while the stylish Rollz Flex is a rollator incognito. Instead of staying hidden indoors, they will be glad to go out again and be independent. They know they will be greeted enthusiastically by friends being curious about their wonderful rollator. Thus they look forward to Holiday gatherings, going to church or watching the New Year’s Eve fireworks. Mobility issues might trouble family outings. By using a 2-in-1 rollator and transport chair, you don’t have to be afraid one of you won’t be able to keep up. You won’t have to quit halfway because now you can alternate walking with the rollator with sitting in the transport chair. Furthermore continue to be part of family days out. This way you can spread your energy to last the entire day. Using the Rollz Motion you can walk along when the family is walking a bit slowly. When more rush is needed to run from one place to another, you ask your “expert wheelchair operator” to help you. Which granddaughter will race you around? Staying active and using your muscles by making a daily walk is a great way to stay fit. Even for people with limited mobility, walking is considered healthy. Some people do not dare to go out, because they are feeling unstable or don’t want to use a traditional walking device. The gift of a rollator that looks great and makes you feel proud is a great stimulus to keep exercising. Now guess who is taking the grandchildren to the park to run and get some fresh air? It is school holiday and they will also like to spend some time with you. 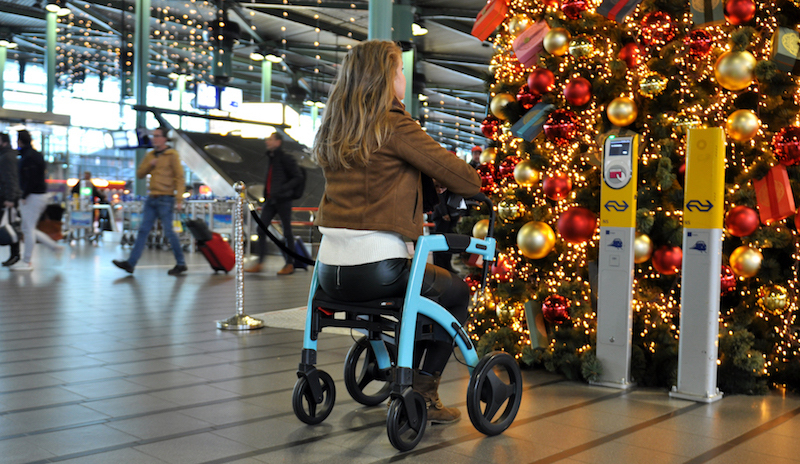 Traveling by plane to your relatives, the Rollz Motion can be your assistant, right to the gate – and beyond. If you need a rollator to bring you to the aircraft, you can use the priority line. And isn’t it nice to enjoy the Christmas atmosphere at the airport together and make the last shoppings? At the gate you fold the Rollz Motion, pack it in its travel cover and the steward will place it into the hold. On arrival you wait a while, for instance in the business seats department, until the big rush is over. Your Rollz will be waiting for you right next to the disembark exit. December days are busy shopping days. Wouldn’t it be nice if your independent mother would be able to do most of the shoppings herself? The Rollz Flex is a rollator with a really huge bag. It is designed to be a combination of a rollator and a shopper as well. It fits safely up to 20 kg of groceries – or most of her presents. The weight is carried between the front and back wheels, therefore the rollator won’t tip over. It is a safe and stable way to transport all her shoppings. Your mum may rest on the seat for a short while, listening to the carols in the shopping mall. Arriving at her car, the inner bag can easily be lifted out before the rollator is folded to fit in the trunk. Seniors today stay active as long as possible, enjoy going out and love beautiful things, in short: they want to continue doing what they always have liked to do in a way that suits them. Unfortunately, not everyone is given to be mobile up to old age. But it can also be a young person with a permanent disability who is recommended a rollator by their doctors. Some people however hesitate to use a walker because of the stigma connected to the usual walking aids. If a mobility device is needed, it better be beautifully designed. Only then, people needing a rollator will be willing to use it, stay active and enjoy visiting family gatherings, that nice sing-along or outdoor event.